Your success page is the final step your customer goes to after completing their purchase. This is typically a thank you page acknowledging their decision to buy from you and also to give further details about their purchase. By default, ThriveCart has 2 built-in success pages which will dynamically generate content based on their purchase behaviour throughout your funnel. Show their order total & invoice (default). Show them unique URLs based on their purchases (including automatic redirection). There are 2 sections where you can set up how your success page work. The first is under your Fulfilment tab. Here you can change from the default “Display their total/invoice” to “Send them to a URL”. Selecting “Send them to a URL” will allow you to enter success URLs for your products which can be used for fulfilment. You can then either use the ThriveCart hosted and content generated success page OR redirect to the URL you’ve set. 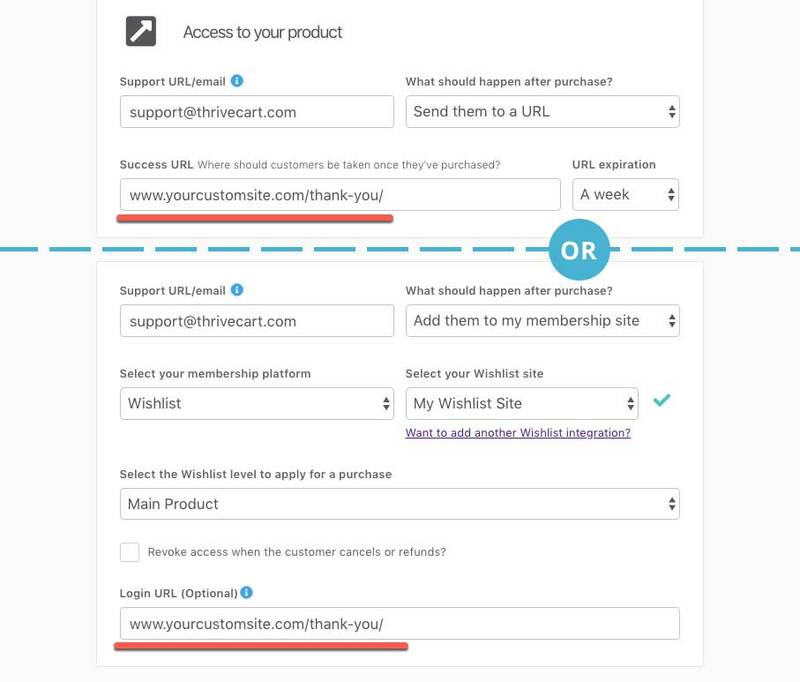 You choose if you’re using a customisable success page or redirecting to your own URL in the Checkout tab and then to the Success Page tab from within your product settings. When using show a customisable success page you will be presented with an editor much like the checkout template editor where you can edit the different elements on your success page. You can also edit the link text used for the links to your product and bump products here as well (within the edit body text section). This type of the success page is what we recommend to new users or users that want a quick solution to display the different products a customer may have bought through their sales funnel. This option is for users who want to automatically redirect their customers to their website upon purchase. It’s great for simple cases where you don’t have any bumps or upsells in your funnel, but even if you do, we send over details of the customer’s order so you can dynamically generate your own content based on their purchases. See this article for further details on dynamically generating content. The URL the customer will be taken to is that of your success URL or Login URL (depending on how you’re fulfilling your product).